Preparing your apartment for a new dog is a lot like preparing it for a child. You’ll have to rethink how you organize, store, and use everyday products. Here are common ways people adjust their lifestyle for the new furry family member. Lock all base cabinet doors: in the bathroom and the kitchen. Dogs are notorious for learning how to open cabinets. Everything you’d be horrified to see the new dog eat, expect it. It’s a good idea to put your trash in a closet or large pantry, according to the same reasoning. As long as it’s locked, you’ll have no need to worry. Don’t be afraid to rearrange your furniture for the new family member. Placing couches and tables in front of outlets, at this point, isn’t a terrible idea. Although it’s less practical, it’s only temporary. Dogs can be anxious in new environments, causing them to do things they normally wouldn’t. Once you know your dog’s personality better, you’ll be able to move your things back how you like them. 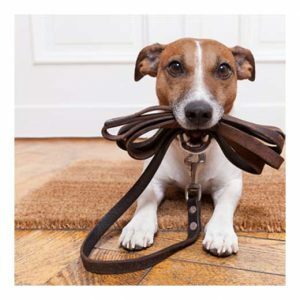 The most important thing, though, is giving your pet the chance to adjust to the new home. The effectiveness of house training techniques varies from dog to dog. If you plan to use crates to train your dog, use it early and often. Most dogs respond better to training with crates when you begin immediately. Don’t let your dog sleep on the couch or bed and then use a crate. Then you’ll just irritate your dog. When used early, however, they are one of the best ways to deter dogs from using your lamp posts as fire hydrants. The post Dog-Proof Your Apartment appeared first on Apartments For Us.